Bruce Schmoetzer began his martial arts training in 1981 studying Karate at Johnson Space Center. He found his vocation in Aikido in 1997 when he began studying with his teacher Wendy Whited Sensei. In 2005 Bruce’s name was added to the wall of yudansha (Black Belts) at Hombu Dojo in Tokyo, Japan. He earned his Nidan (2nd Degree) in 2014. 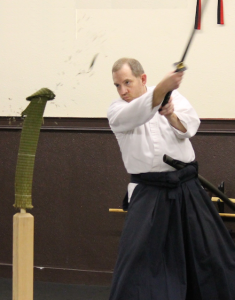 Since 2007 he has been the chief instructor & dojo cho of Beartooth Aikido in Richland, WA. In his day job, Bruce is the founder and chief consultant for Wilke Systems where he makes technology invisible. In previous lifetimes he has worked for NASA (twice! ), Apple and AT&T among others. He holds a BS in Physics from Purdue and an MS in Nuclear Physics from Kent State. Originally from Kentucky, Bruce now lives in the Tri-Cities where he curates a comics collections built over 30+ years, is valet for 2 cats, indulges his addiction to cooking and loves his appleTV & DVR.